When sheet piling and other retention systems require ground anchors only the most secure robust system will do. In-ground anchors are the strength behind the piling system. ASP Piling, the experts in ground retention systems, has designed and developed an anchoring system for ground and walls that is effective, economical and versatile. We also offer bracing solutions where anchoring is not possible. 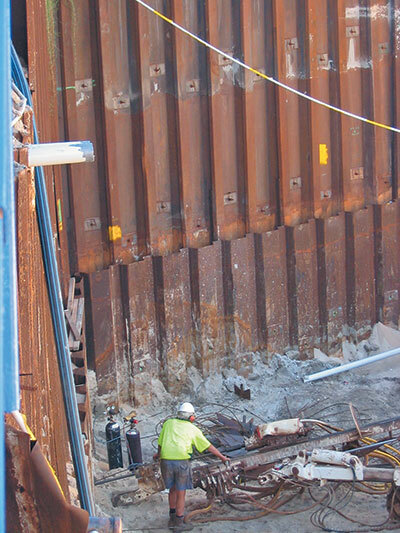 Ground anchors are used when loads from adjacent structures are being transferred through within the excavation support zone, or when the depth of excavation is too deep for a cantilevered shoring wall. Anchors are also used when construction load needs to be situated in close proximity to a shoring wall. When ground services and adjoining property conditions are not conducive to anchoring, the ASP team offers alternative bracing solutions. Major developers rely on the experience and expertise of ASP to work with engineers and draftsmen to come up with the best solutions for their site. ASP’s experience will help streamline local authority approval process whenever an application for anchor approval on adjoining properties is required. Flexible: ASP’s anchors provide clients with more options to maximise site efficiency. Fast: ASP anchors are generally a non grouted anchor, meaning, the stressing of ground anchors can take place immediately after installation is complete. Safe: Ground anchors provide security and safety for load bearing equipment deployed close to sheet piling. ASP Expertise and Experience: The anchors provide maximum efficiency to our client’s construction project, while ASP helps streamline preparation of local authority approval applications. Contact us today to learn how we can make your project a success or call us on 1300 949 607. ASP ground anchors installed on a 9 metre excavation help ensure stability and safety of the sheet piling wall.